Raising a cockatoo as part of your family is a lot like caring for a young child. Cockatoos require a lot of your attention, as a lack of attention creates boredom, which leads to poor behavior. 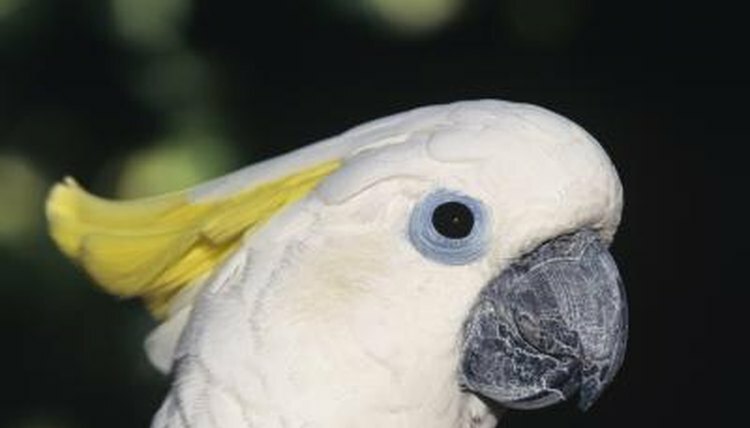 Without enough stimulation, cockatoos may exhibit behavior such as screaming and self-mutilation, like plucking their own feathers and chewing on things. Prevent harmful behavior by playing with toys and games and teaching him tricks. Cockatoos enjoy playing with toys of different colors, shapes and sizes. Playing with toys will exercise your cockatoo, both mentally and physically, and keep him out of trouble. Give him toys he can shred, such as natural, unbleached and unpolished cotton ropes. Tie a knot in the rope and see if he can untie it. Give him untreated wood toys that he can peck at and chew on. Cockatoos love toys that have movable parts, like puzzles, but you may need to show him how to use it first. Be excited when showing him the new toy, and he will likely find the toy to be exciting, too. Clean and move his toys around his cage every once in a while, as well as introduce new toys to prevent boredom. Spending time with your cockatoo is extremely important to develop his socializing skills and keep him busy, as well as to bond with him. Cockatoos love to play dress up. Use doll accessories, such as hats or capes, and make pretend that your cockatoo is a cowboy, a superhero or a handsome prince. For a more active game that allows him to keep his mouth busy, encourage your cockatoo to play catch with you. Toss him a little ball and insist that he toss it back to you. Award him the first several times so he understands the idea is to return the ball to you. For independent play, cockatoos love to create adventures by climbing around on play gyms and swings. Teach your cockatoo how to dance with you by flapping your arms, kicking around your legs and singing along to music. While you dance, repeat "dance" so he becomes familiar with the term and the motions that go along with it. If you get him excited enough, he may join in on your dance party. Eventually, you may be able to get him to "dance" on command by playing certain songs you usually dance to together, or just by saying "dance." You can also teach your cockatoo to give you a high five with his feet or his wings. Wind down the day by reading to your cockatoo. Reading will calm him since you're paying attention to him, as well as give him something to focus on; especially if you read with emotion and use interesting facial expressions. While reading, act excited during interesting parts of the book and sad during emotional parts. It does not matter what you read to him, whether it's a novel, newspaper or children's book.